1 Creekside. 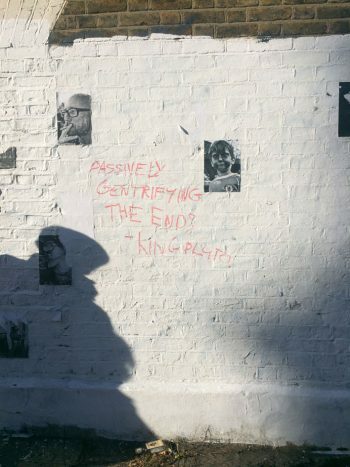 Deptford Art & Gentrification Walk Pt.2, 29 Oct 2018. 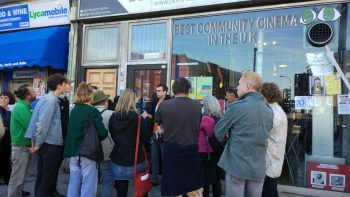 Frank Magennis talking about Deptford Cinema. Deptford Art & Gentrification Walk Pt.2, 29 Oct 2018. Photo by Darshana Vora. Many thanks to everyone who came along and contributed to our events in September. A very special thanks to John Fortnum who facilitated the book club and to all the participants, artists, activists, venues, galleries and studios that we visited on the Deptford Art & Gentrification Walk! Many thanks to the Save Reginald Save Tidemill campaigners, to everyone who helped out and to everyone we encountered along the way. Very excited to be gearing up for the second independent Critical Theory in Contemporary Art Practice course on Monday! Our next event of the season is the book club on 12 October with a discussion on the Culmination of Separation, the first chapter of Guy Debord’s book the Society of the Spectacle. The discussion will be facilitated by Penelope Kupfer and Darshana Vora. Our first quarterly meeting is on Friday, 26 October 6:30-8:30pm at Larc and everyone is welcome to attend and contribute to our plans for the future. We will discuss the book club, the proposal for a research and reading group on radical pedagogy, alternative art education and self-organisation, a new alternative studio programme and a new series of feedback sessions. Jenny Holzer  ‘Alienation produces eccentrics or revolutionaries’. Marquees series. Philip Guston  Painting, Smoking, Eating. Oil on canvas, 196.8 x 262.9 cm.